Happy Leap Day everyone! Today I have a fun collaboration for you with the talented Kathy of The Daily Marker. Not too long ago, Kathy and I made plans to try and do a monthly coloring collaboration. The idea was to color the same image - her with Copic markers and me with watercolors. 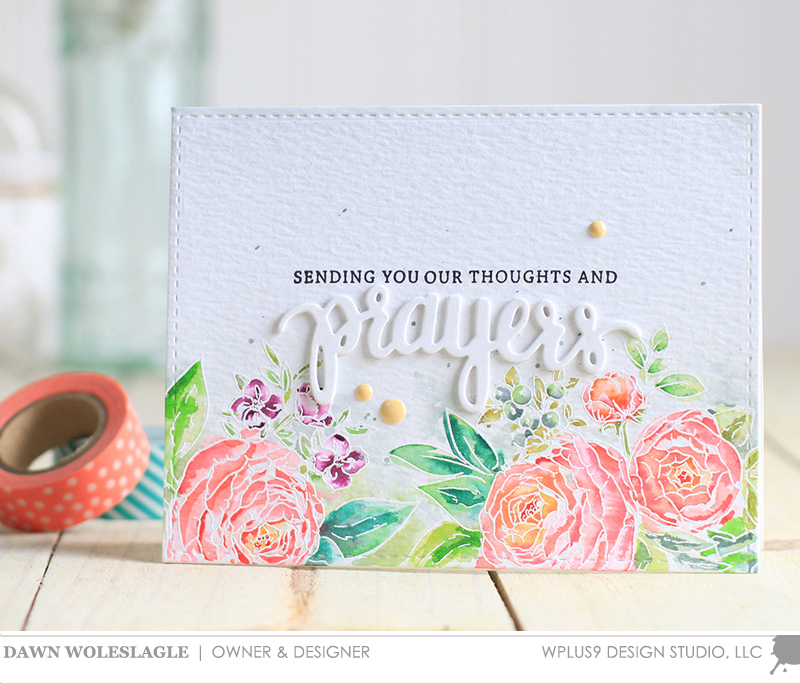 We chose to start with the Beautiful Bouquets: Ranunculus stamp set. This is the perfect stamp for those times when you just want to focus on and enjoy coloring. The arranging is already done and you can just stamp and color. See what I mean? As mentioned in the video, the watercoloring of this card took about 20 minutes. But, if you wanted to go even simpler...the one below has less layers of detail and only took about 10 minutes. I hope you enjoyed today's projects and please be sure to stop by Kathy's to see her take on this image with Copics! EDITED TO ADD: When we chose this image a while ago I did not anticipate it would be sold out. I'm so sorry! But, they are on their way back in stock and should be available again in about a week. So if you are looking to grab this one, you can sign up to be notified by email as soon as it becomes available again here. Hi, it's Maureen here with a happy little card for you on this Saturday morning. The new Happy Birds stamp set definitely puts a big smile on my face. What about you? I'm a big fan of the clean and graphic look. I love to contrast black and white with pops of color, like I've done here. I started by die cutting a piece of white card stock using the Sunshine Layers die. Then I blended Distress Inks over it to make a bright background. Knowing that the rest of my card would be all black and white, I really wanted this background to pop. I stamped the sentiment and images and then die cut them and added them to the panel with foam tape. Before finishing the card, I used a Copic Multiliner pen to draw stitch lines around the focal panel. This simple technique helped to bring the whole design together. 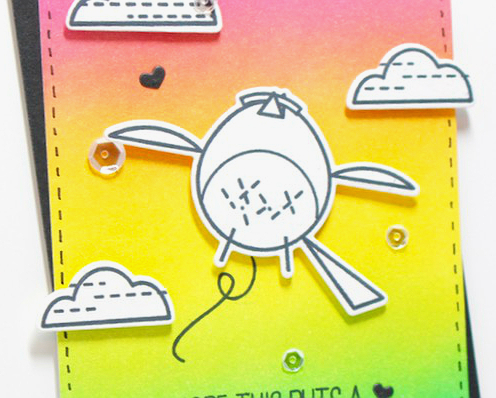 I almost forgot to mention this little detail...I wanted my bird to look like he was flying or jumping for joy, so I flipped through my WPlus9 stamp set and found this stamp from the Festive Greetings stamp set. I think it's perfect ! Thanks so much for stopping by. Have a happy day! Hello everyone! 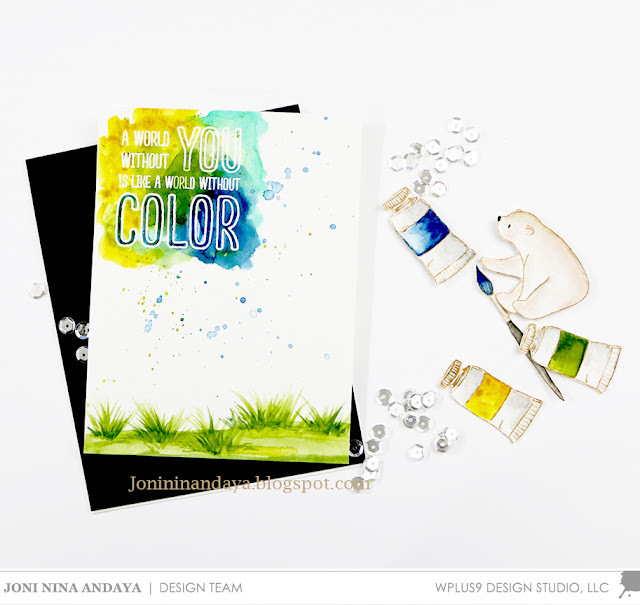 It's Joni and today I'm sharing my take on the awesome new Color My World stamp set. And, I'm combining it with an unlikely candidate - the cute bear from the Happy Mail stamp set. 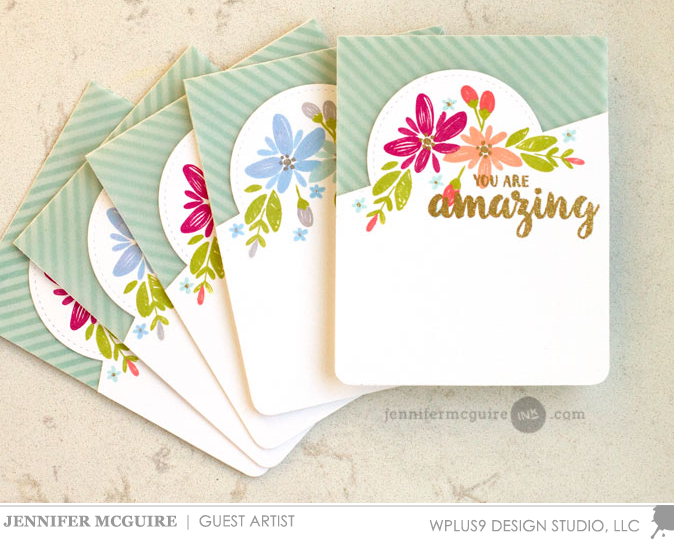 Although these are two completely different styles of stamp sets, they make a perfect match, don't you think? To begin, I created a standard A2 card base from black card stock and a watercolor panel just a little bit smaller than an A2 card. 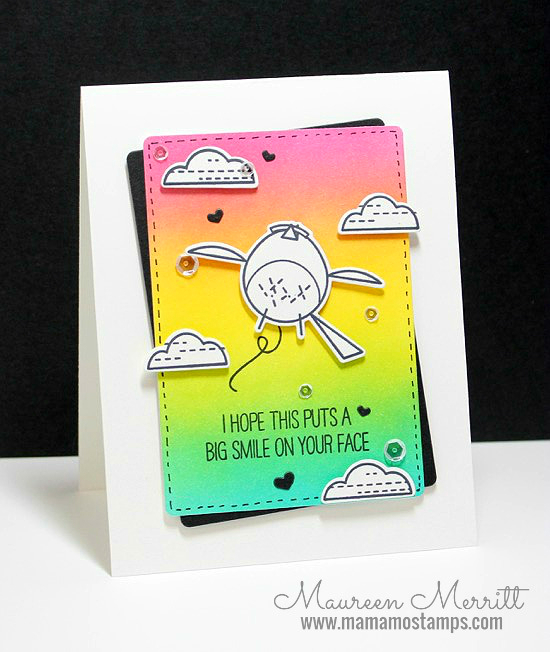 Next, I stamped the sentiment from Color My World in Versamark ink and heat embossed it with white embossing powder. 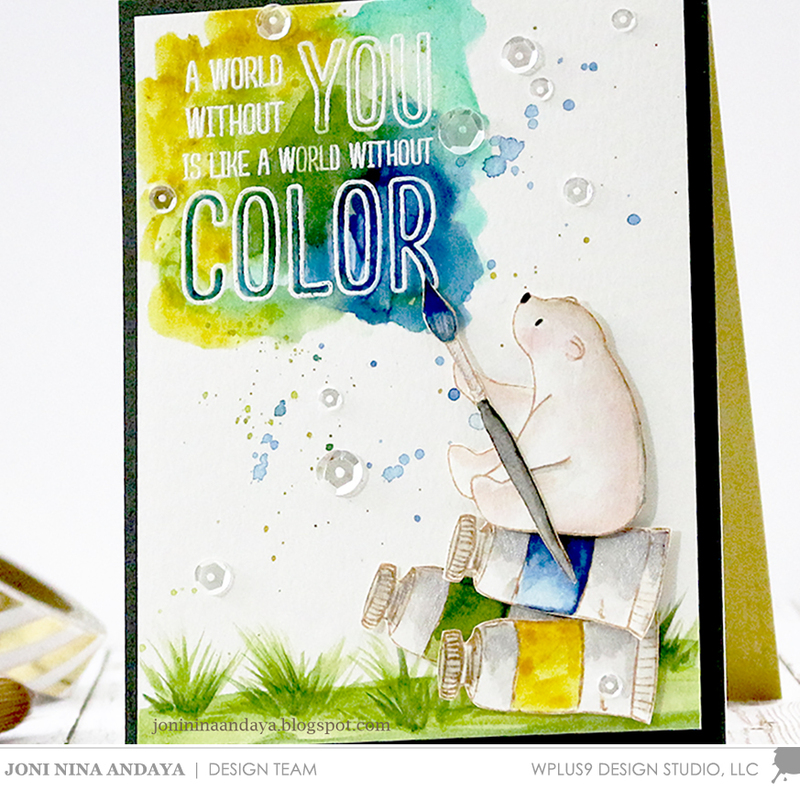 Using Windsor & Newton watercolors, I added bright pools of color over the sentiment and a just a bit beyond. 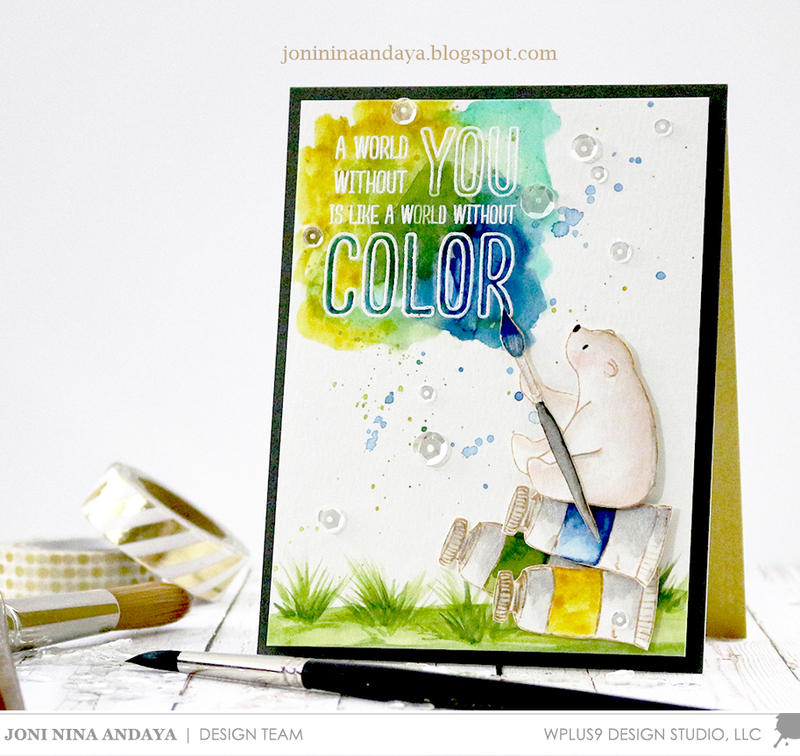 The heat embossing resists the color and allows the sentiment to pop out of the pools of color. The grass was added with a little free-hand watercolor (grass is an easy one to tackle free-hand as it doesn't have to be perfect). I also watercolored the bear, ink tubes and paint brush images, fussy cut them and adhered with foam tape. A little sparkle in the form of Pretty Pink Posh Sparkling Clear sequins finishes it off. Hello! 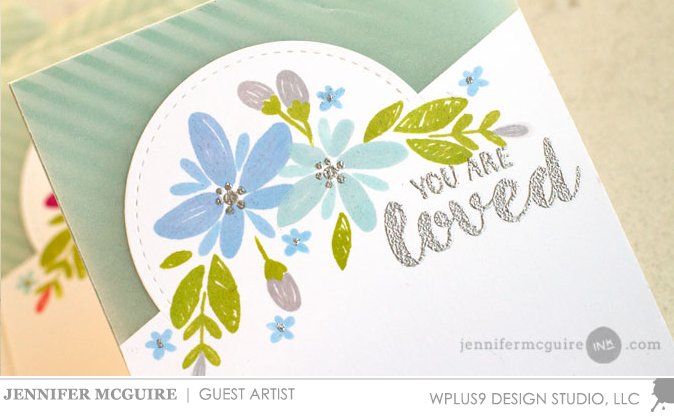 Today we have a video from Guest Artist Jennifer McGuire. Jennifer is well known for her clever techniques (almost as much as for her incredible kindness and giving heart). She is great at breathing new life into our old supplies, as well as combining them with new supplies for that "How did she do that?" moment. 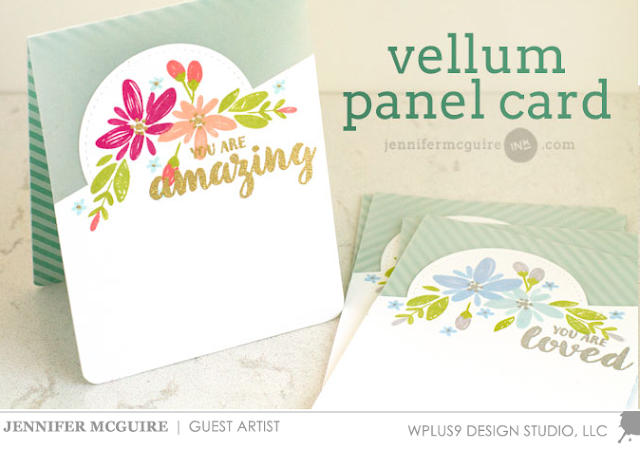 I am honored to share a fun set of cards that she created utilizing vellum along with some clever die cutting. 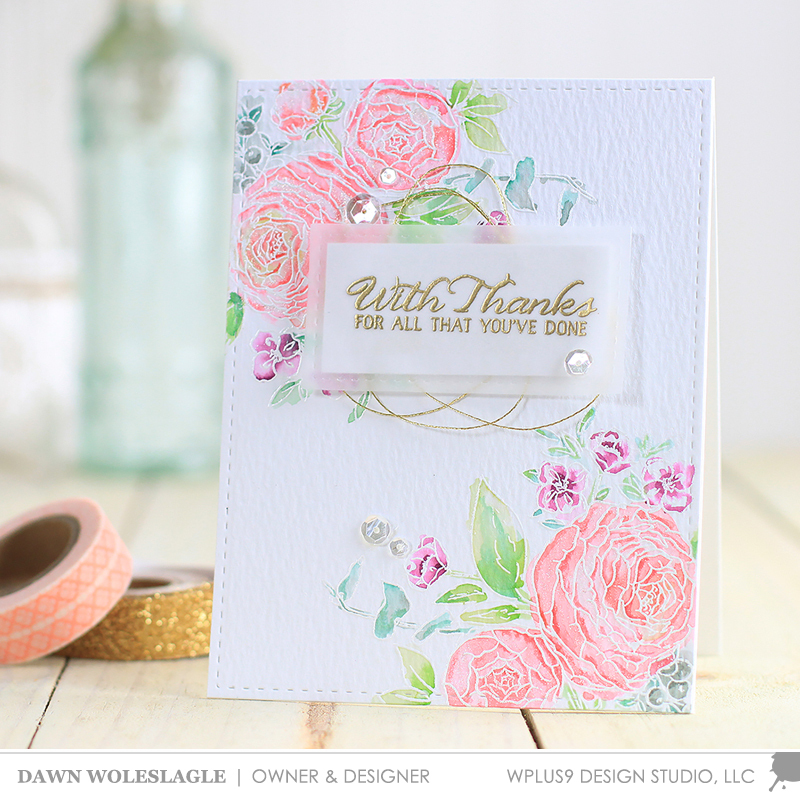 Personally, I just love how she used the little leaf image in the Happy Wishes stamp set to expand and alter her main flowers. A great big THANK YOU to Jennifer for always providing endless inspiration and joining us here on the blog today! And thank you for stopping by. 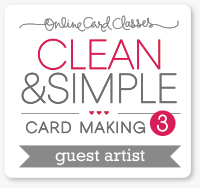 I hope you enjoyed today's guest artist!